An X-class solar flare erupted from the Sun’s surface in 2012. At the time, it was the largest flare in five years. Image credit: NASA/Solar Dynamics Observatory (SDO) via Getty Images. Solar flares are spectacular sights from space, where giant streams of plasma are ejected from the Sun’s interior at incredibly high energies and speeds. They stream through the Solar System, usually traveling the Sun-Earth distance in three days or fewer. While this intense, ionized radiation would be dangerous to an astronaut in the depths of space, for the most part our planet’s magnetic field and atmosphere shields our bodies from any harm. The magnetic field funnels the radiation away from Earth, only enabling it to strike in a region around the poles, while the atmosphere ensures that the charged particles themselves don’t make it down to the surface. But their changing magnetic fields do, and that’s enough to induce currents in electrical wires, circuits and loops. Thankfully, now that NASA’s STEREO-A and STEREO-B spacecraft are both alive simultaneously, we’ll get the earliest warnings possible if a potential catastrophe is headed our way. You might think this is a rare event, but it’s not at all rare like a meteor striking Earth is rare. It’s not even “rare” in the sense that seeing a supernova from Earth is rare; an ultra-high-energy solar flare directed right at Earth is a question of when, not if. Imagine a beautiful, clear day. The Sun is shining, the skies are clear, and you couldn’t ask for a nicer day. All of a sudden, the Sun itself appears to brighten, just for a brief amount of time, like it released an extra burst of energy. That night, some 17 hours later, the most spectacular auroral display ever brightens the night in a way you never imagined. Sunspots are often, but not always, portents of where a solar flare is most likely to occur. Image credit: Shahrin Ahmad (ShahGazer), Kuala Lumpur, Malaysia. Workers across the United States awaken at 1 a.m., because the sky is as bright as the dawn. Aurorae illuminate the skies as far south as the Caribbean, beneath the Tropic of Cancer. And long, electricity-carrying wires spark, start fires and even operate and send signals when there’s no electricity! This even includes, believe it or not, when they aren’t plugged in. This isn’t a science-fiction scenario; this is history. This is what a catastrophic Solar Storm looks like, and this actually occurred exactly as described in 1859. A significant coronal mass ejection from the Sun that (thankfully) was not directed at Earth. Image credit: NASA / GSFC / SDO. The way this actually happens is that the Sun, rather than being this constant ball of nuclear fire in the sky, has an active surface, complete with an intricate magnetic structure, temperature variations, sunspots, and occasional flares and mass ejections. For reasons we don’t completely understand, the Sun’s activity levels ebb and peak on an 11-year timescale known as the Solar Cycle, and the transition between 2013/2014 was anticipated to have been the peak of our current cycle. We’re more likely to see larger numbers of flares, as well as stronger-than-average flares, during the peak years, but in reality they can occur at any time. Typically (but not always), these flares pose no danger to anything here on Earth, for a variety of reasons. 1.) Most solar flares are not directed anywhere near the Earth. Space is a big place, and even at our relatively close distance of 93 million miles (or 150 million km) from the Sun, that’s a long way away. Even though most sunspots occur near the solar equator, more than 95% of flares and ejections, when they occur, never impact our planet at all. But there is that pesky few percent that does impact us. 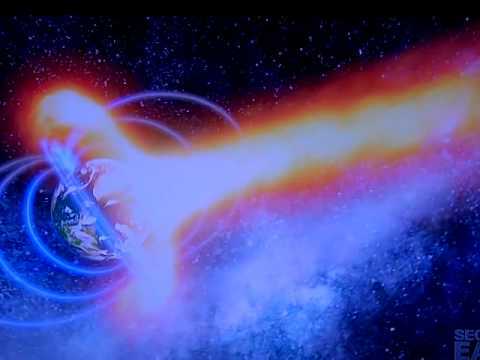 A representation of how most ionized particles are diverted away from Earth by our magnetic field. Image credit: NASA. 2.) Most flares are too small, too slow and sub-optimally aligned to get past the Earth’s magnetic field. Our magnetic field is awesome! Sure, it might be less than 1 G (gauss) at the surface (or 0.0001 T — for Tesla — for you mks sticklers out there), barely enough to deflect your compass needles towards the magnetic poles. But the field extends far into space, and the matter ejected in a solar flare are almost exclusively charged particles, which typically move at speeds of only a million miles an hour. These particles are bent by our magnetic field (as are all charged particles moving through a magnetic field) and will mostly be deflected away from the Earth. The ones that are bent into the Earth will crash into our upper atmosphere; this is the cause of nearly all auroral events. The atmospheric effects of the aurorae, as seen from space. Image credit: NASA / ISS expedition crew 23. 3.) Our atmosphere is sufficiently thick to prevent these charged particles from irradiating us. Even if the flare moves quickly (or at about five million miles-per-hour), is huge (containing billions of tons of matter), and is aimed directly at us, the charged particles will never make it through our atmosphere, down to the surface. In fact, they peter out to practically nothing nearly 50 km above the Earth’s surface, far higher than any mountains or even that the heights airliners reach. Unless you’re in space (for some reason) at the time, you won’t receive any more radiation than you normally would, and there is no biological risk. But there is one real risk, and it’s a consequence of our physical laws of electromagnetism. The anatomy of the dangers of a solar flare. Image credit: NASA. A charged particle is bent as it moves through a magnetic field because of the connection between electricity and magnetism. But that same connection means that a change in electric currents — which are made by the motion of charged particles — create changing magnetic fields. And if you have a changing magnetic field either around a wire or through a loop or coil of wire, you will generate electric currents! So while there may not be a danger to you, there is a huge danger to electronics, ranging from automobiles to transformers to — most frighteningly of all — the entire power grid! That’s the real danger of a solar storm: an event similar to the 1859 Carrington event could cause anywhere between an estimated $1-to-$2 trillion of property damage, mostly due to electrical fires and damage to our infrastructure. A number of NASA satellites throughout the solar system. Image credit: NASA. With the space weather satellites we had up just a few years ago, we would have about a half-day’s warning to shut down our power stations and voluntarily shut off the grid in the event of such a flare. With STEREO-A and STEREO-B operating simultaneously, however, we can know as soon as the flare occurs, giving us up to three days of lead time. These events cannot be predicted in advance, and neither can their interaction with the interplanetary-and-Earth’s magnetic field, so you must never listen to fear-mongers who tell you a catastrophic solar flare is imminent; we can only be prepared to react when one is detected. The combination of NASA’s STEREO-A (ahead) and STEREO-B (behind), combined with the solar dynamics observatory (SDO) near Earth gives us a full view of the entire photosphere of the Sun at once. Image credit: NASA. Ideally, we’d be able to either upgrade the grid or to simply install a sufficient amount of electrical grounding, but practically, the first option is a long-term project that no one is working on, and the second one is continuously thwarted by thievery of copper wire. Power stations and substations simply do not maintain enough grounding due to this thievery, and there’s no known antidote to that, since if death-by-electrocution isn’t enough of a deterrent, what will be? There’s no need to be afraid of these things, but you do need to be prepared. If an ultra-massive, fast-moving coronal mass ejection ever heads directly towards Earth, you are literally taking your life into your hands if you do not shut down and unplug all of your electronic devices — and your power companies deliberately black out your neighborhood — until the storm passes. Long-distance wires, power stations and substations and the major components of the electrical grid itself will be at the greatest risk, as they will have huge direct currents (in systems designed only to carry AC) induced in them. The smartest move for those components, quite honestly, might be to sever the wires. That’s the only surefire way we have of personally safely dealing with things now. But you should also keep in mind that there’s only about a 1% chance we’ll get a large, powerful Earth-directed flare in any given year, and only about a 0.2% of getting an event like we did in 1859. So be aware, be informed and know how to deal with it if it happens, but don’t lose any sleep over it! Instead, your best bet is — when applicable — to go outside and enjoy the auroral show! This article is dedicated to Jake Morgan, whose fascination with solar storms led him to write his first book: Sunburned. Jake recently suffered a catastrophic accident and is undergoing significant time in the ICU; you can help support his GoFundMe here.